6" x 9" The Fraser river passes through a particularly narrow gorge six miles south of Lytton, B.C. In 1884 the Canadian Pacific Railway chose this point to cross to the east bank via a 600ft. tunnel and 528 ft. bridge. 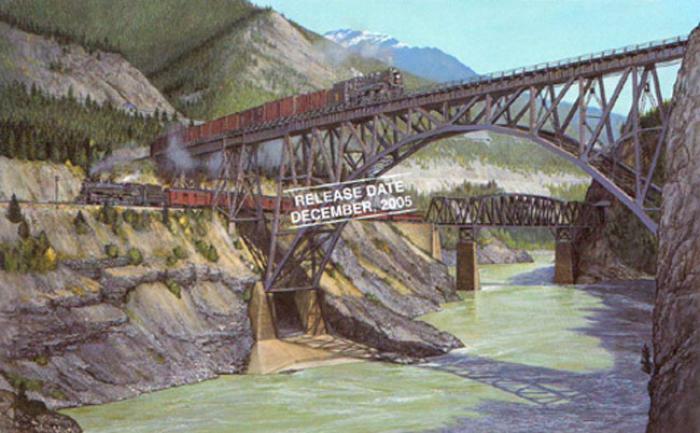 When the Canadian Northern laid its line through the Fraser and Thompson canyons 30 years later, they were forced to use the opposite side of the river, as the canyon walls afforded little enough room for one railway. Consequently, a bridge had to be erected at this point to transfer the tracks to the unoccupied bank of the Fraser. The east bound trains are C.P. 's Dominion, Montreal section, led by Pacific type #2701 and a C.N. freight pulled by an N-5 class 2-8-0.